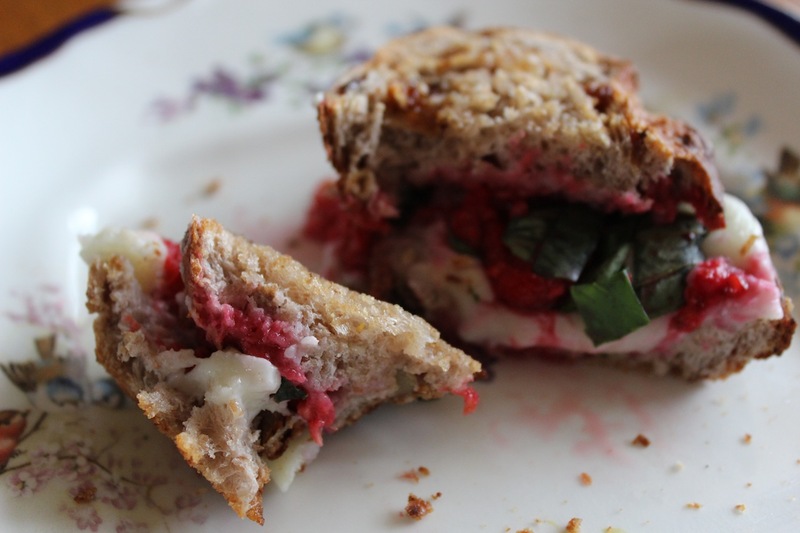 Posh Cheese Toasted Sandwich? Yes Please! I do see his point, it is a bit much putting up a sandwich recipe. 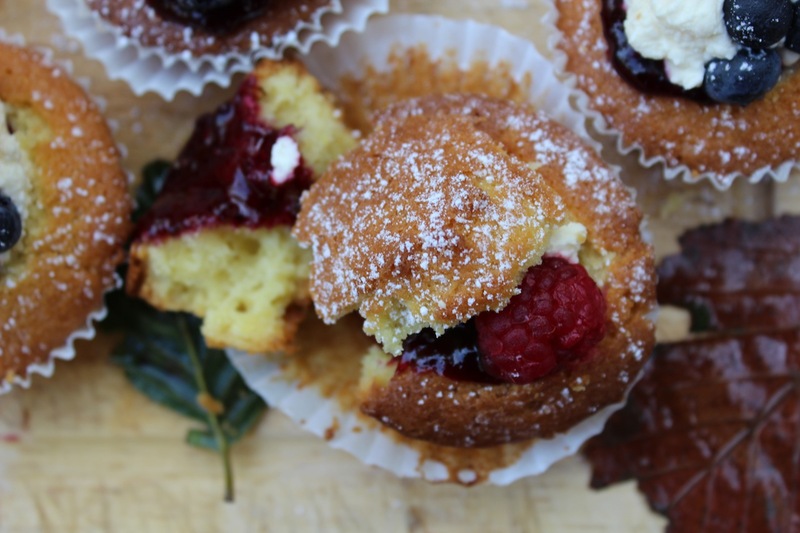 But this blog is just a collection of my favourite things to eat, and honestly the simpler something is to make while still tasting delicious the better! 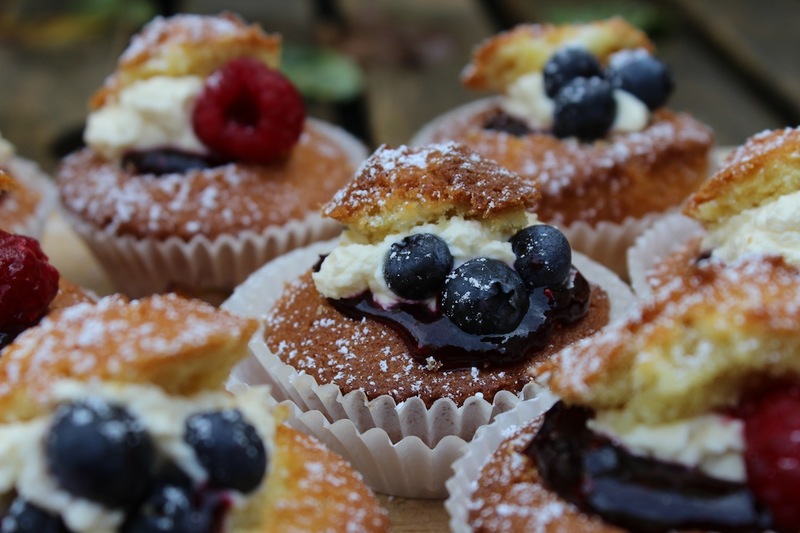 This is my 100th blog post, and while I probably should be putting up something impressive, I feel if I can’t blog about something I like to eat, then what’s the point! 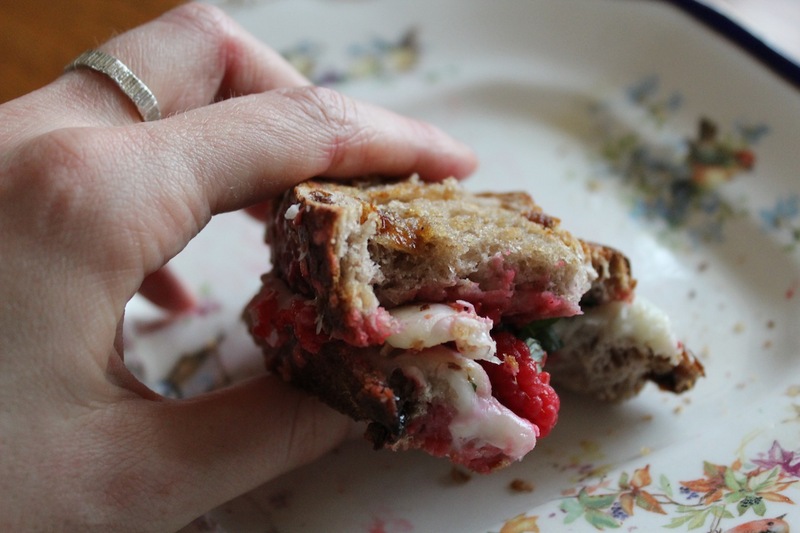 It’s also Irish Farmhouse Cheese Month and I am obsessed with cheese…. 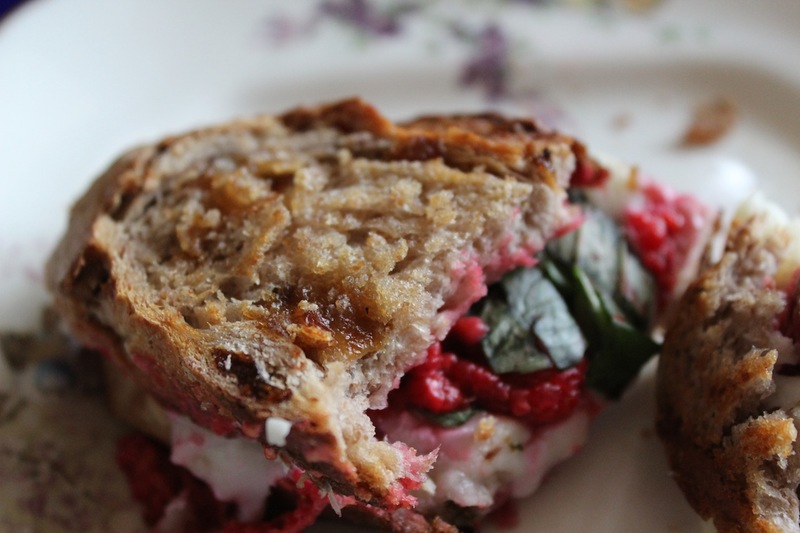 Or maybe I just wanted another excuse to make another cheese toastie… Either way, here we are. 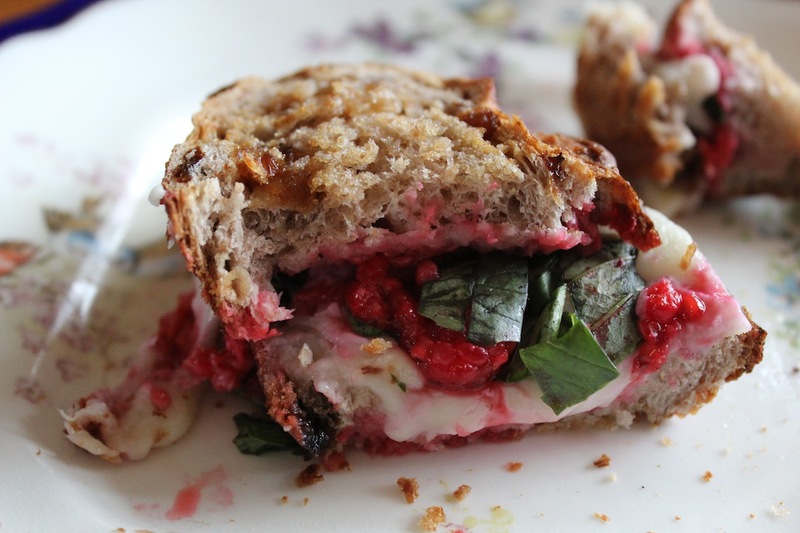 Bread, cheese and raspberries are some of my favourite things to eat, so why not squish them together in a melty, oozy and crispy sandwich? 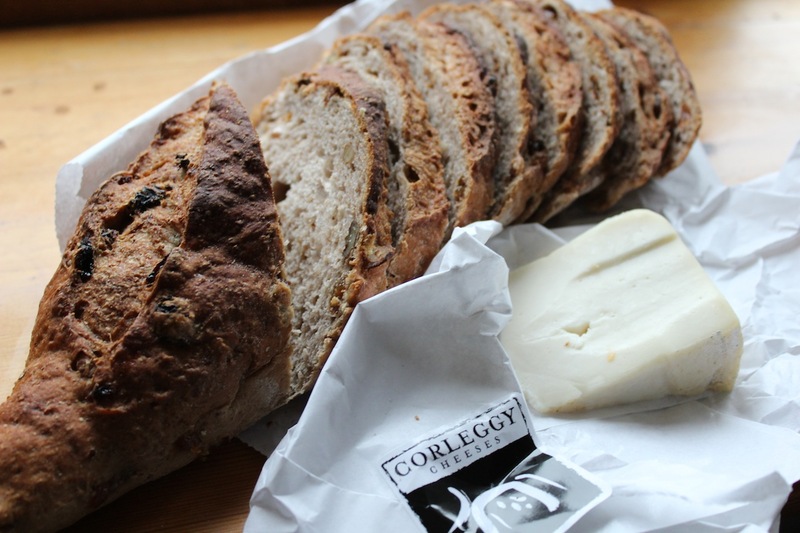 I love the Temple Bar farmers market and go there every weekend that I’m in Dublin, and Corleggy Cheese is one of my favourite stalls- their cheeses are incredible and I really love their raw sheep milk cheese, which you can see melting out of the pictures above. 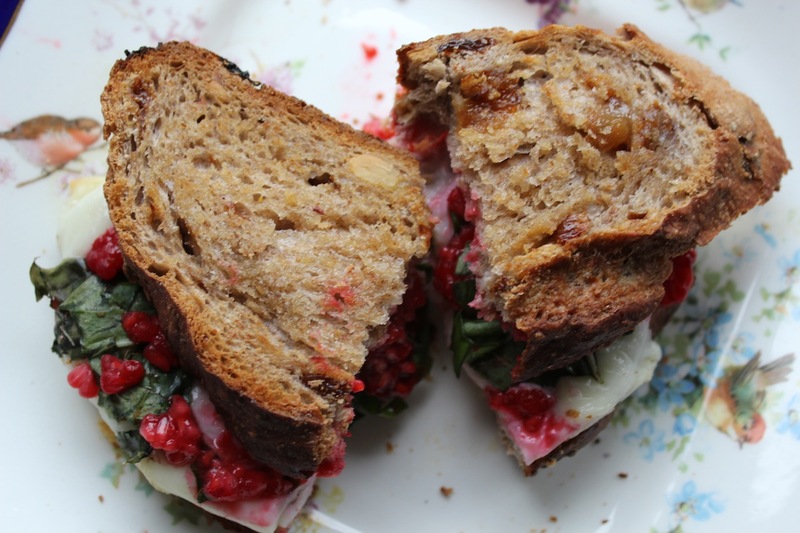 I also tried the La Boulangerie Francaise stall last weekend for the first time and their fruit and walnut bread was incredible, which I used here. And really, who can go wrong with some good bread and good cheese? 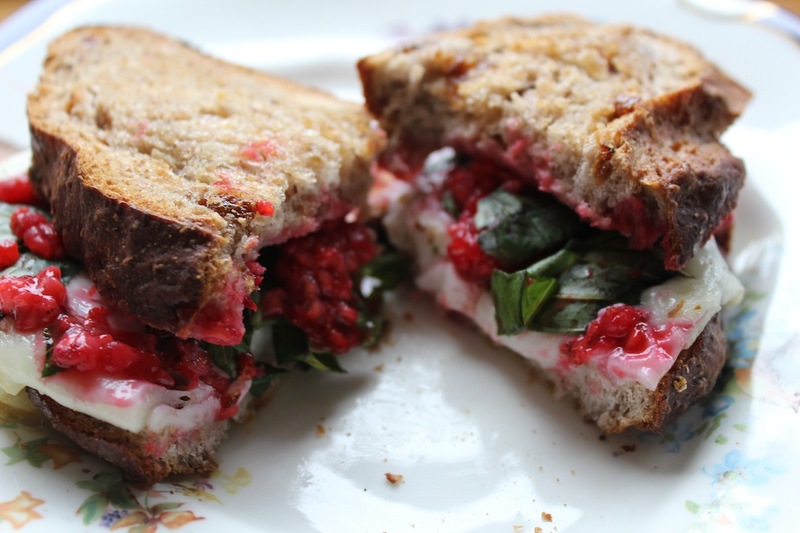 Try the below to pimp out your standard cheese toastie, and see how the raspberries and fresh basil pack a flavour punch. 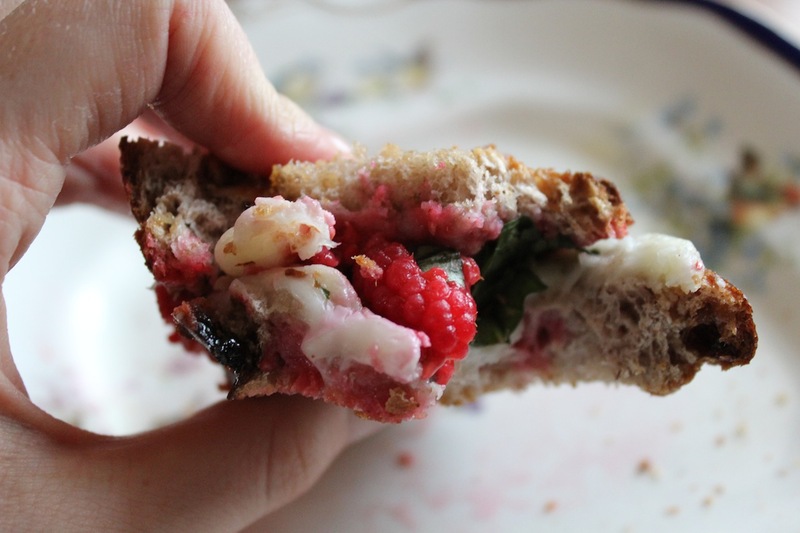 Good Bread… Good Cheese… What More Do You Want? 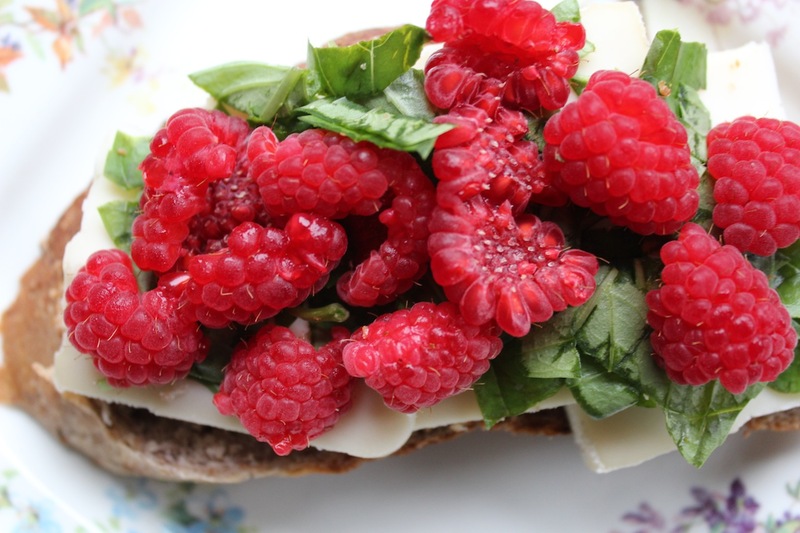 Layer your cheese, raspberries and basil between your two slices of bread. Last weekend my sister and her boyfriend were coming over for dinner and I wanted to make something delicious to impress them but I also wanted the whole thing to be a chilled affair in which most things would be prepared in advance and I could chill out and relax with a glass of wine while serving things up in an effortless and stressed-free manner. Ha Ha. What actually happened was a very different affair. 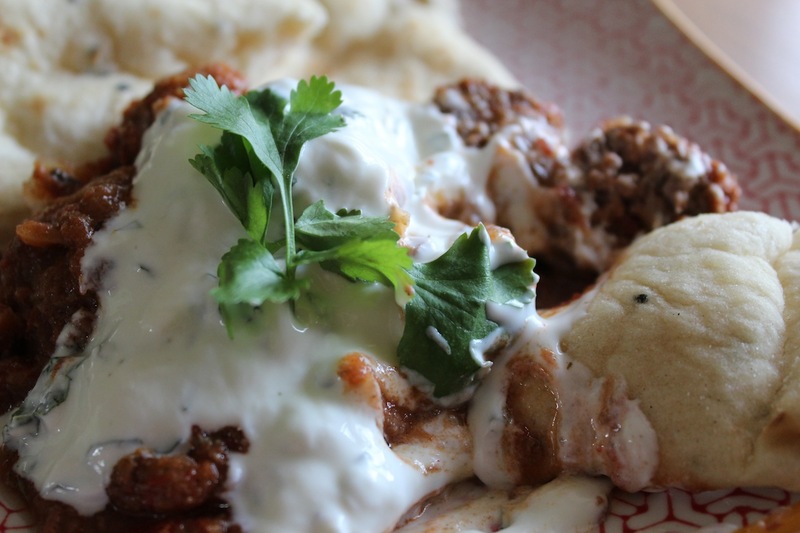 The menu was roasted squash and chorizo bruschettas, these lovely meatballs with yoghurt and Naan for mains, and chocolate mousse with shortbread for dessert. I should have known the night before that things wouldn’t be exactly plain sailing. A seemingly “fool-proof” chocolate mousse recipe, was not in fact so fool-proof and I ended up overcooking the chocolate into a dark lumpy mess and the booze in the mousse made it seize up. Thankfully I had more chocolate and eggs so we decided to start again with my boyfriend taking over the reigns (this was his signature dessert and so obviously I got it all wrong, having never made it before). Or not. Same thing happened second time around, but it being 11pm, and not really caring anymore, we decided lumpy chocolate mousse was better than no chocolate mousse and so we threw it in the fridge and hoped for the best. I had already roasted my squash for the starters the next day, and felt that tomorrow I would have ample time to prepare. Wrong again. As it turns out, arriving home at 6.30pm from a day out in town was not a good idea when your guests are due to arrive at 7.30pm (which ends up being 7.15pm when you have a super punctual sister). Even worse, my “helper” decided to take a nap so I was left to my own devices… Never a good idea. As I furiously squished together meatballs, blitzed sauce and tried not to burn toast for the bruschettas the clock was ticking past 7pm and all of a sudden my guests arrived. With my not so helpful helper missing (‘man-flu”- fellow men will sympathise, women won’t), me dressed in old jeans and a wooly jumper rather than dress and heels as planned, no table set, no glasses out or no wine at the ready ,I though I would melt into an oozing cesspit of rage/stress. Alas, miraculously after cracking open a bottle of wine everything seemed to fall into place (I find alcohol has that effect) and once these meatballs were served all was well again in the world and we actually ended up having a really great night! 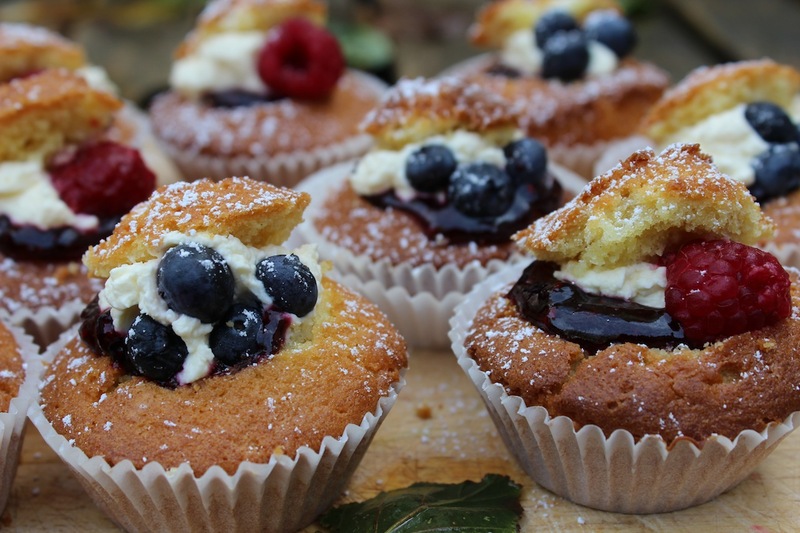 Despite my lengthy rant, these really aren’t difficult or hassle to make, unless you only start making them when you’re guests arrive which I do not advise. 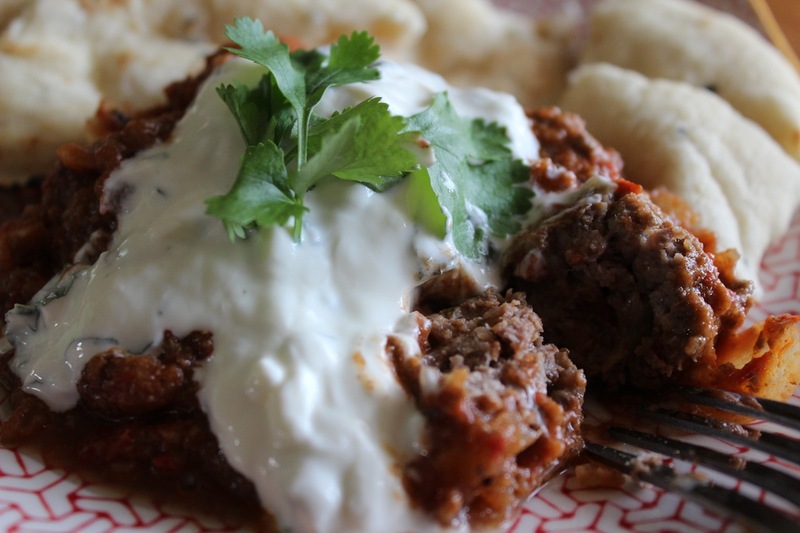 These would be delicious with lamb mince instead of beef mince also, and you can leave out or add in any spices you want. 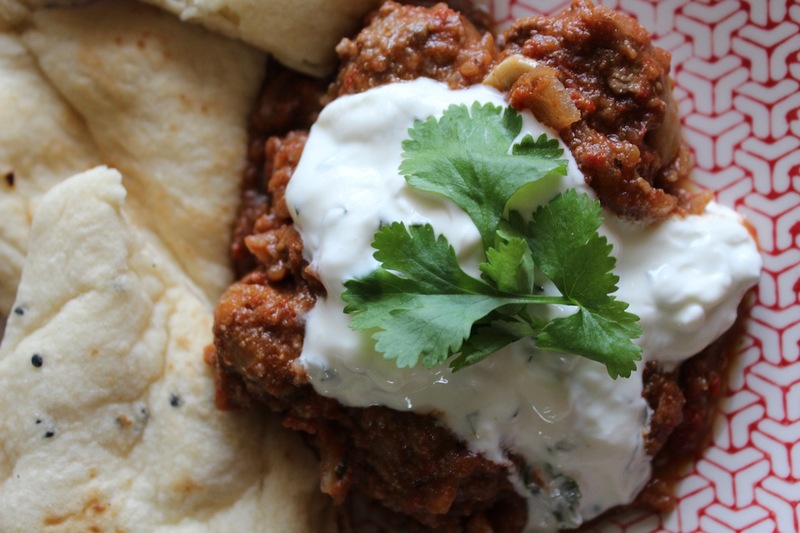 These aren’t too hot, but you can always use less chilli if you have a sensitive palate, and if you’re coriander isn’t your thing, just leave it out along with the paprika and cumin, and throw in a bunch of chopped basil for Italian style meatballs instead. As always, these freeze perfectly. Fry your diced onion and garlic in a large oiled pan until softened through. 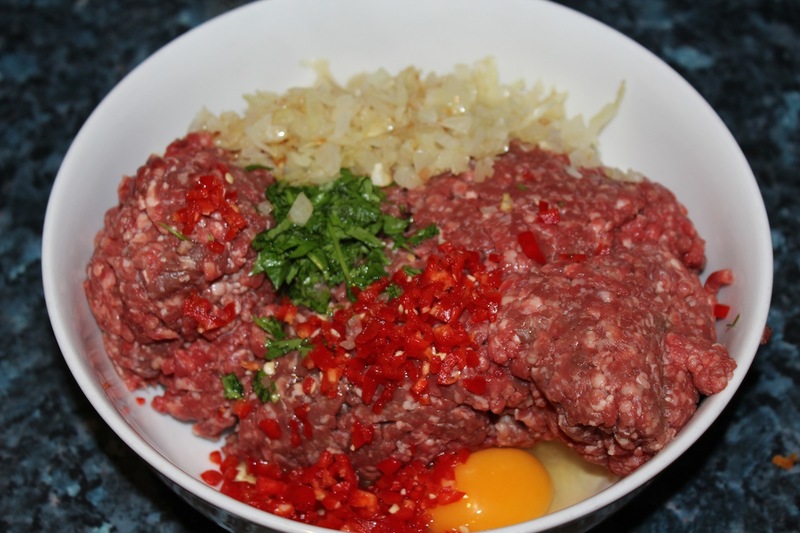 When softened set aside to cool for a few minutes and then add to a bowl with the beef mince, chilli, coriander, egg, salt and pepper. Mix together well with your hands and roll into little balls with your hands (about and inch high). Fry meatballs in some olive oil on a high heat to brown all the sides. 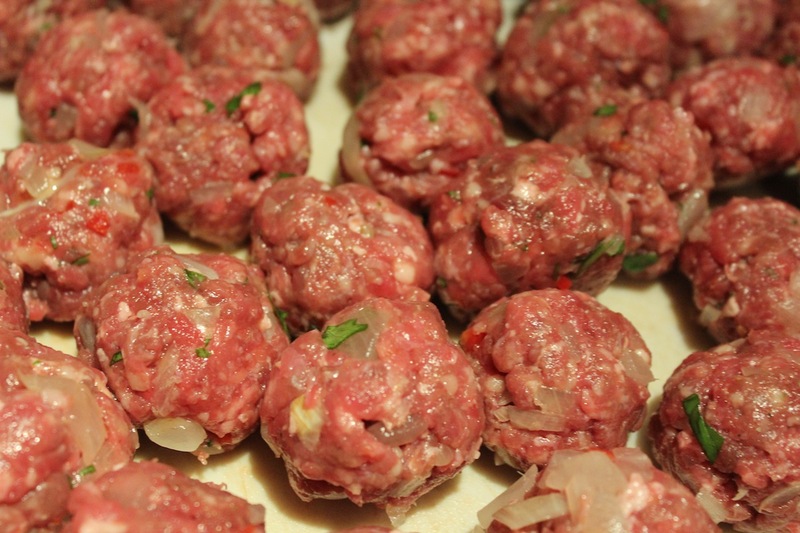 You may need to do this in two batches as this recipe makes a lot of meatballs. When all are browned on the outside (should take about 5-10 minutes per batch) set aside. 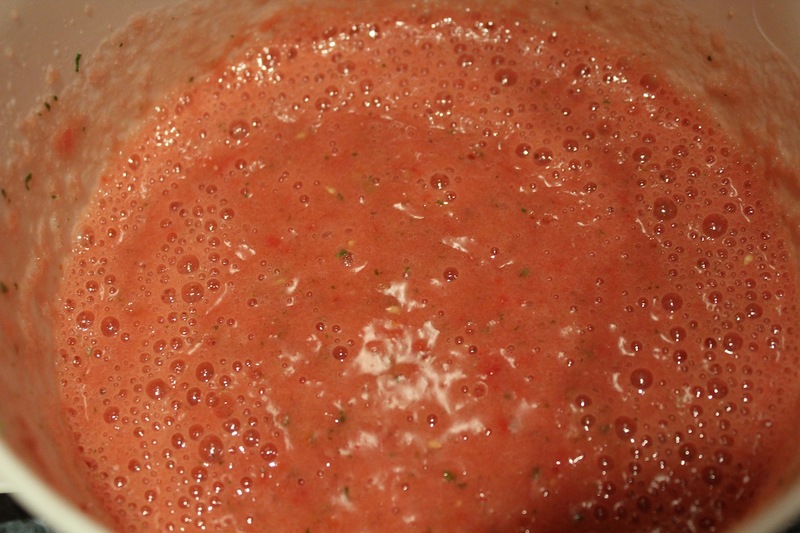 With a hand blender, blend your tomatoes, chilli, salt and coriander into a smooth sauce. Tip your finely sliced onions and garlic into a large heavy bottomed pot with a little oil and fry until soft. Then add in your sauce, stirring until hot. Tip your browned meatballs into the sauce, add your cumin, paprika and additional salt/pepper if needed and let it bubble away until the sauce reduces down into a nice thick sauce. Let the meatballs simmer away on a medium heat in this pot for 20 minutes to ensure they are cooked through. To make the yoghurt sauce just mix together the ingredients until combined. 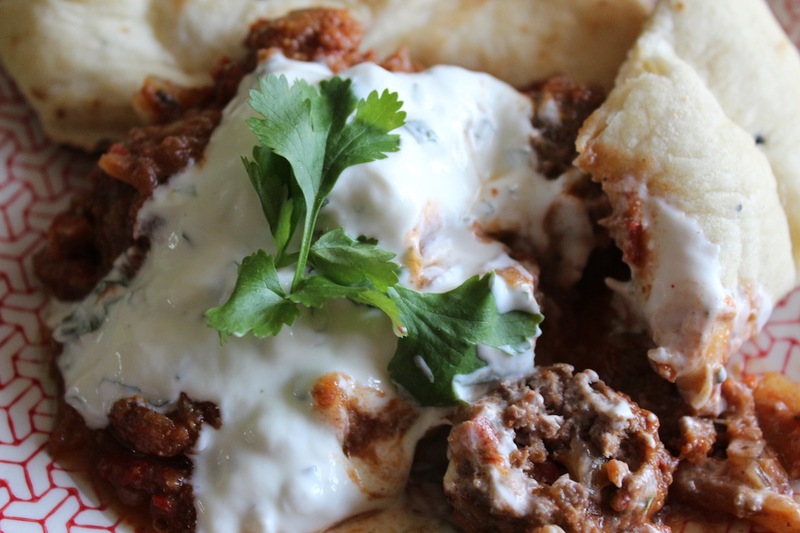 If you are serving with Naan bread or other flatbread like I did, sprinkle the breads with a little water and pop into a hot oven for 5 minutes until hot. 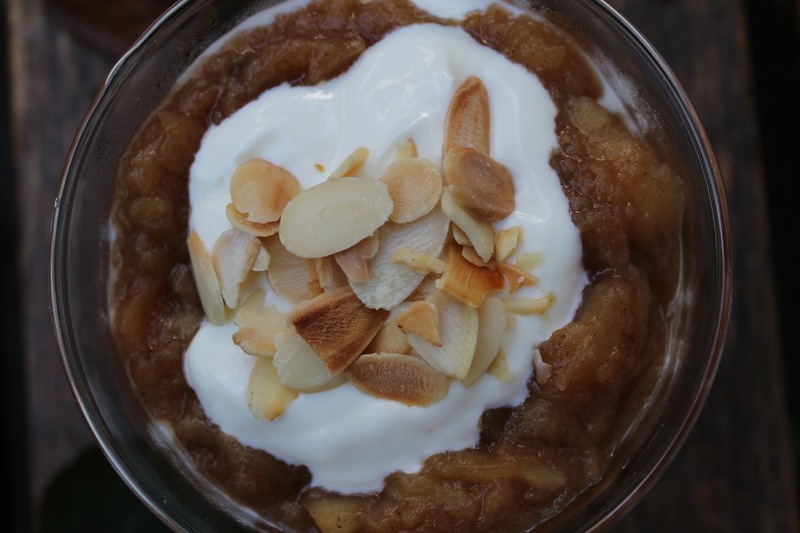 This dish is a result of some stolen apples. My neighbours apple tree grows over into our garden and little apples plod onto the grass in the back garden regularly. 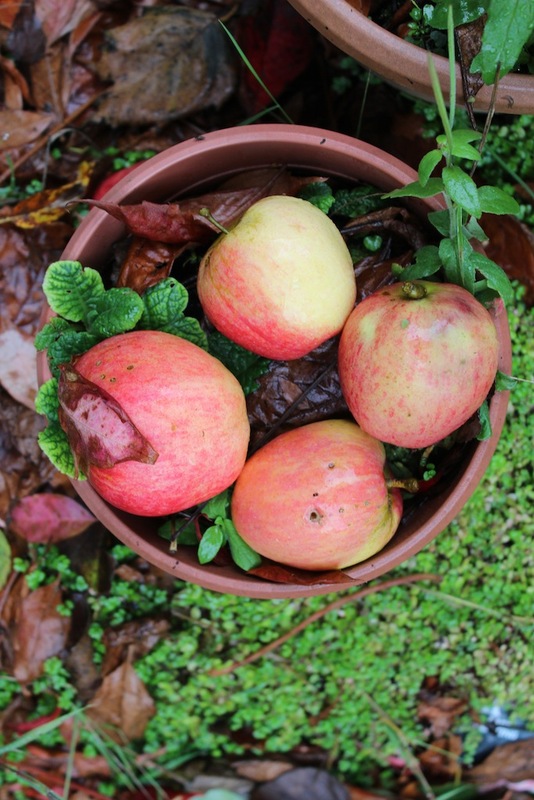 When I was home last weekend I decided to use a few fallen apples to make sure they didn’t go to waste. 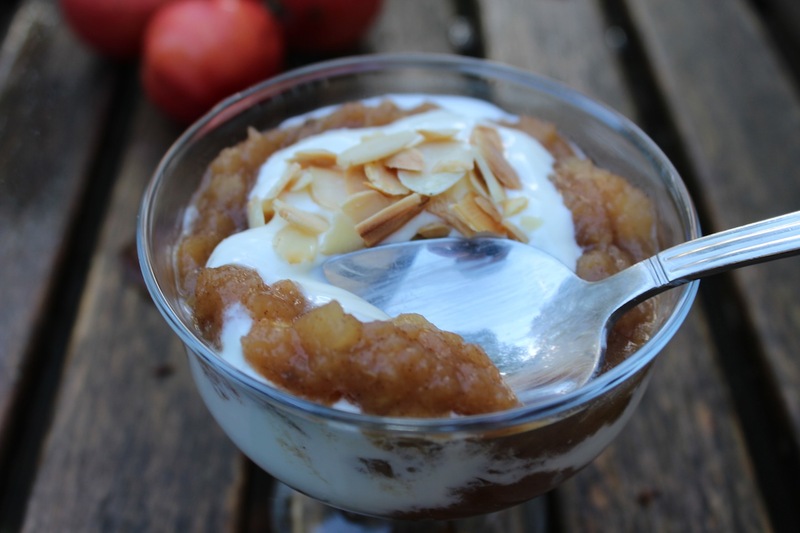 I wanted to make a nice warming breakfast that was still nice and healthy so I decided to stew some apples with nice warming spices and serve it with delicious Greek yoghurt and toasted almonds. 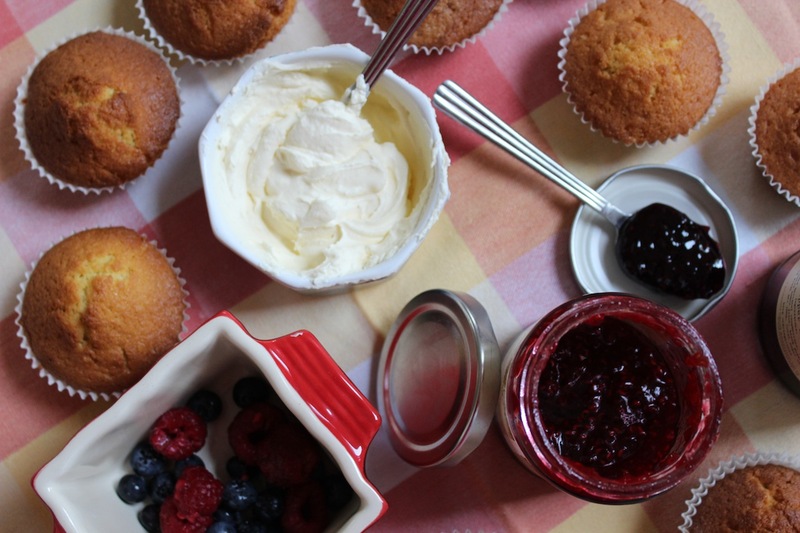 Not exactly re-inventing the wheel, but I think the simplest of foods made well can often be the nicest. This is really really easy to do and doesn’t take long to make. 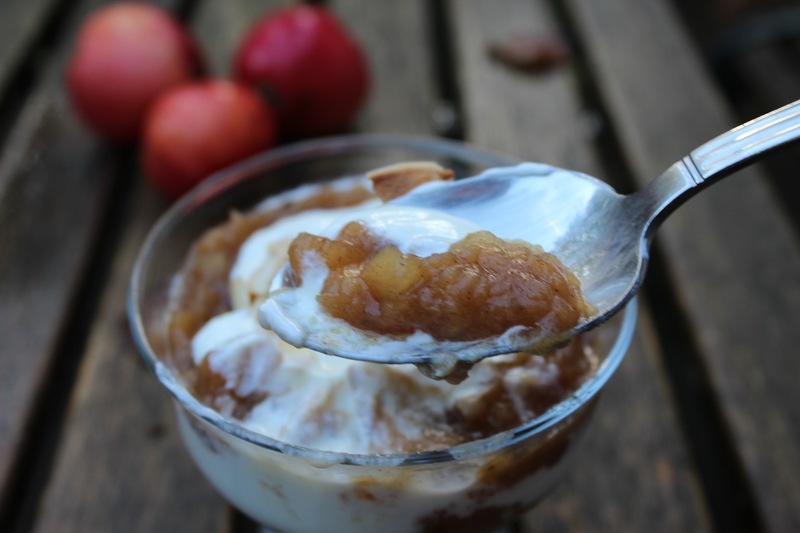 This makes about 4 servings of spiced stewed apple, but you could make more and it will keep well in the fridge for a few days, or you could freeze it. 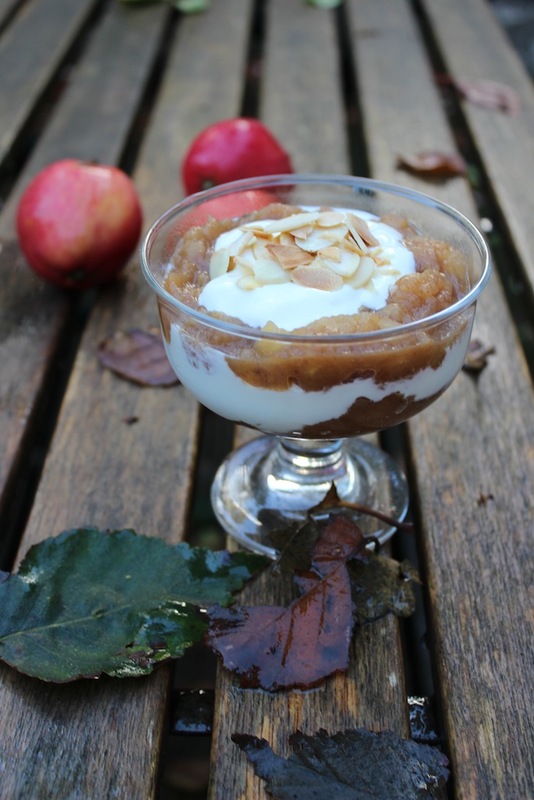 This is a lovely healthy way to start your day this Autumn. 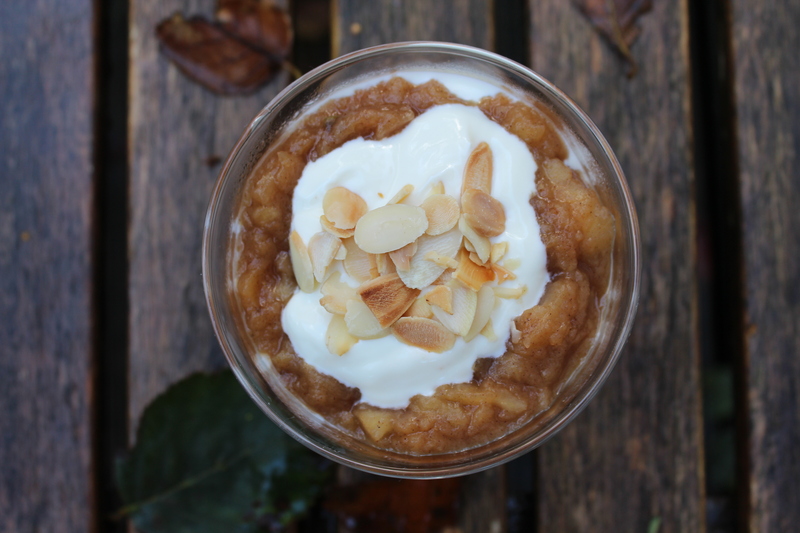 Peel and chop the apples into little pieces and pop into a heavy bottomed pot on a medium high heat. Add brown sugar and spices, stir well to combine and put the lid on the pot. The steam will help the apples cook faster, but stir every few minutes to make sure it doesn’t stick to the base. It should only take about 15 minutes for this to stew down. 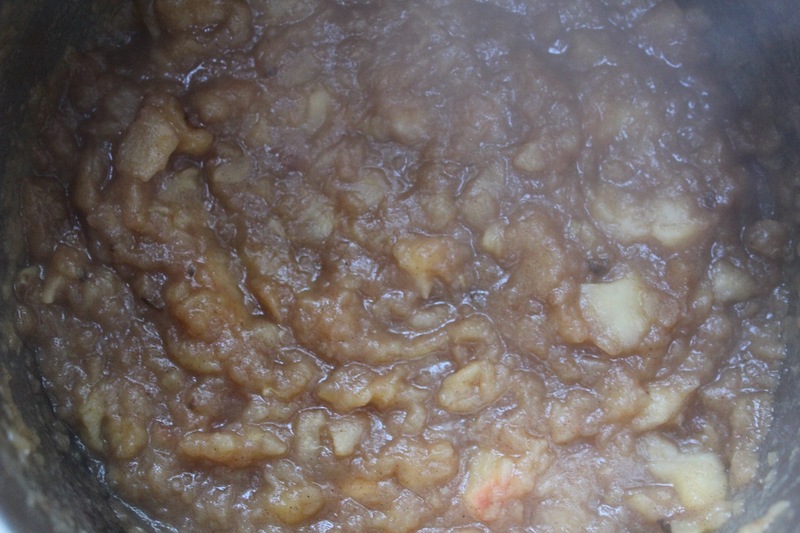 Add the water (more or less depending on how dry or loose your stewed apple is) and stir well for another 5 minutes. Let cool slightly. Meanwhile toast the flaked almonds on a dry pan on a high heat, stirring constantly for a few minutes until just turning golden. Be careful as they burn very quickly. When done remove from hot pan. 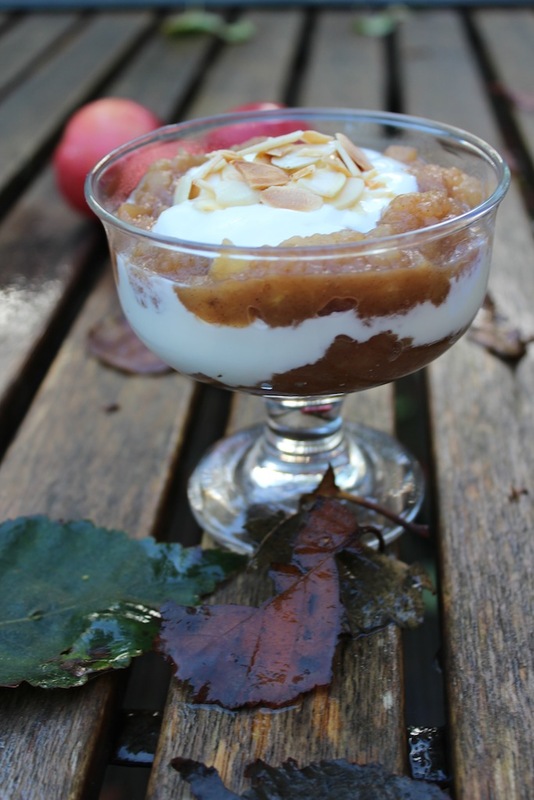 Serve apple in layers with greek yoghurt in bowls or tall glasses and sprinkle with toasted almonds. I recently had the pleasure of taking a trip to the G Hotel in Galway which is an absolutely stunning hotel where we were pampered with all sorts of culinary delights, delicious cocktails and the most amazing spa treatments. The hotel was designed by Irish milliner Philip Treacy and the whole hotel is designed in the most unique and stunning way. If you have the chance to splash out for a night in Galway, this is the place to stay. 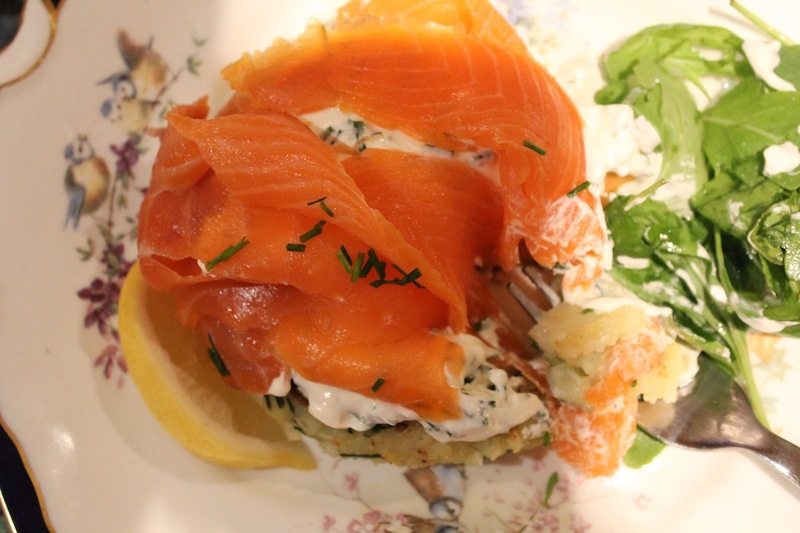 While there I had a delicious breakfast one morning of potato cakes with creme fraiche and local smoked salmon. It was the perfect weekend breakfast and when I came back I decided to make it for dinner one evening. 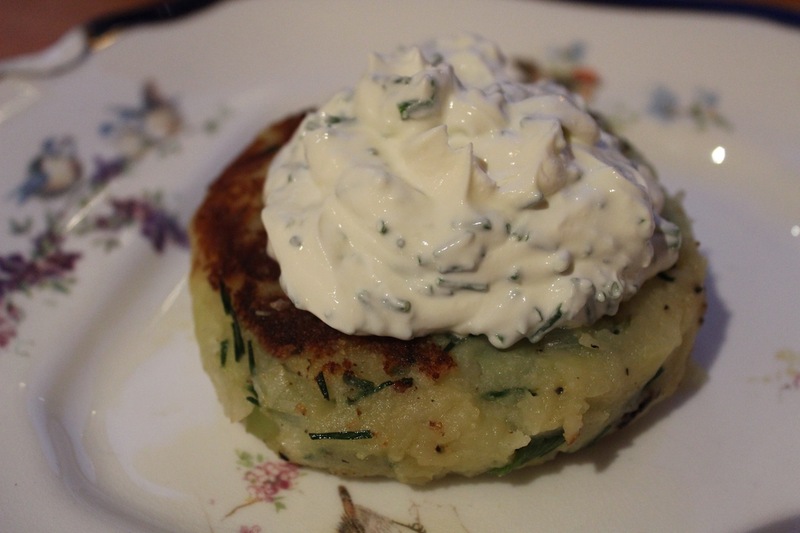 I added spring onions and chives to my potato cakes to give it some lovely flavour, and really once you have made the potato cakes, there’s not much else to do but mix up some creme fraiche sauce which takes a matter of seconds and drape some delicious smoked salmon over the top. This is the kind of meal that you can happily eat at any time of day, perfect for breakfast, lunch or dinner. 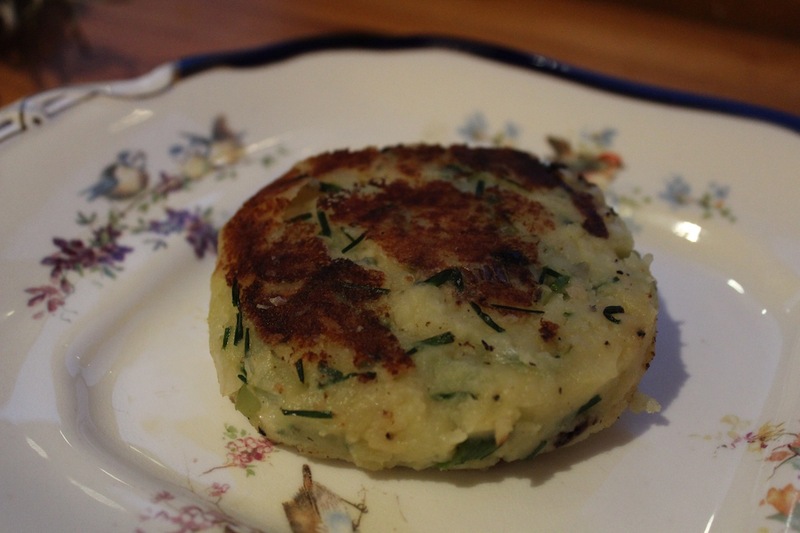 The potato cakes really are quite easy to make, once the potato are boiled it is just a case of mashing them up and adding in the seasoning. I did my usual trick and made a batch of them and froze the rest which would be perfect sides for a few quick meals in the coming weeks. 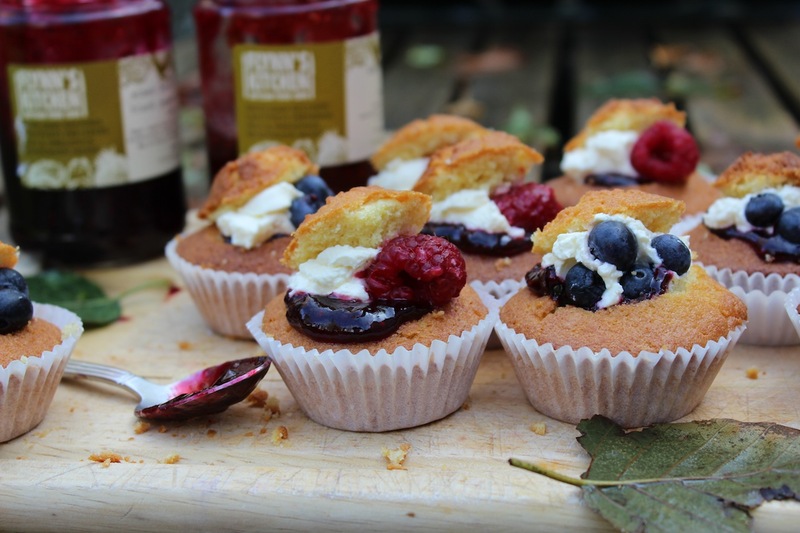 I hope you give these a go, they are really delicious and well worth the effort. When cooked, peel the potatoes and pop into a large bowl with the butter and start mashing. 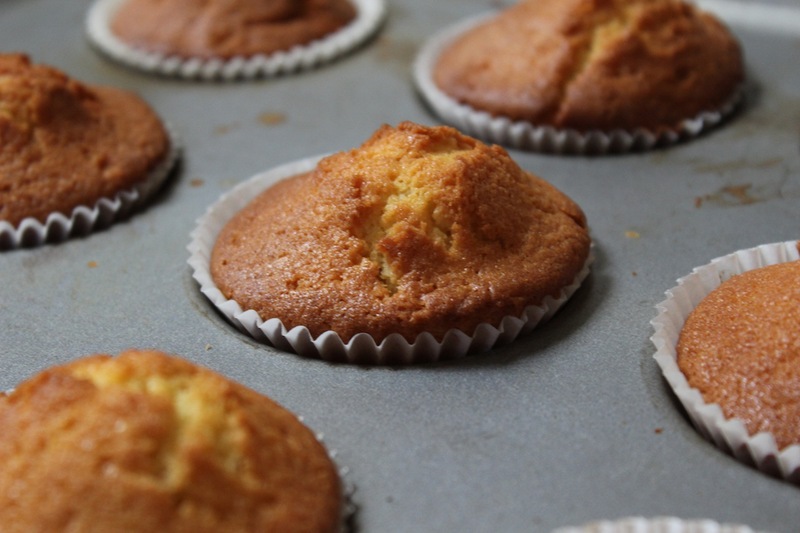 You can use more or less of the butter depending on the texture of the mash, you want it soft. Add in the cooked scallions, chives, salt and pepper. Mash until combined, but don’t over mash as the potatoes will get starchy. 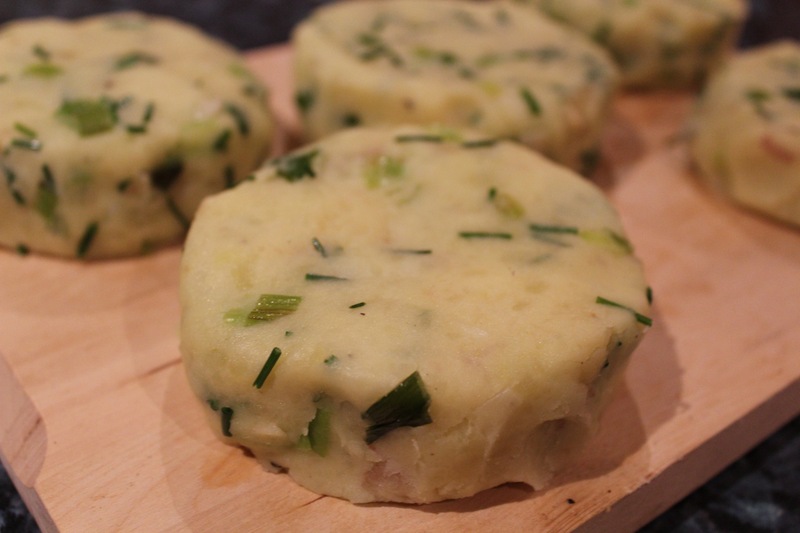 Portion the mash out into equal amounts and squish into disc shapes with you hands. 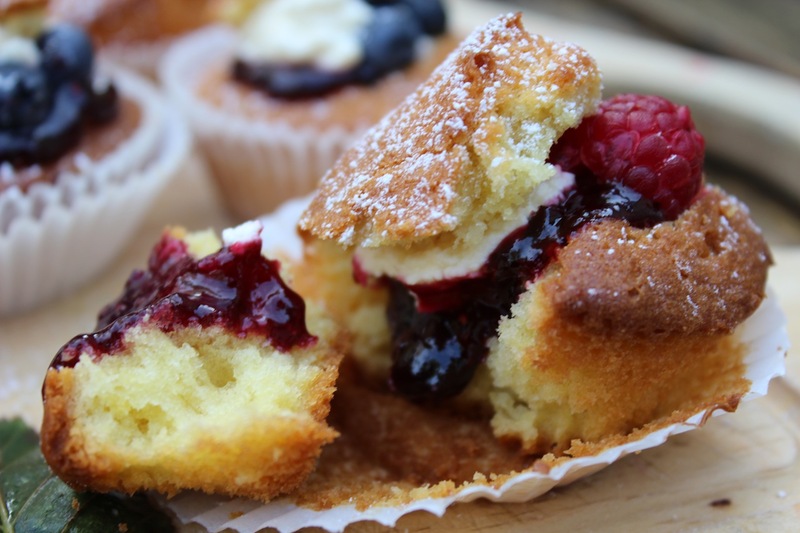 Bake in an oven with a little oil on a baking tray for about 20 minutes at 200C. Alternatively you can fry on a medium heat with a little butter or oil for a few minutes either side, you only want these golden in colour. Make sure to oil the pan well as you don’t want the potato sticking to the pan. 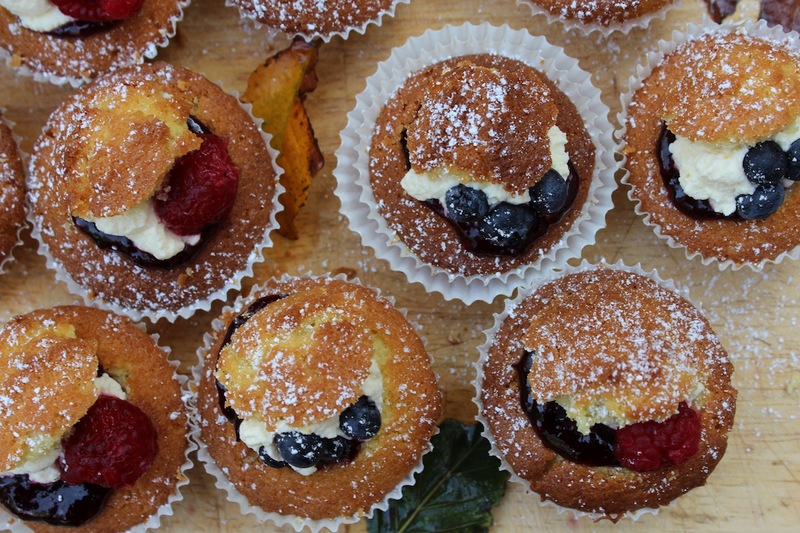 (I prefer them baked rather than fried). 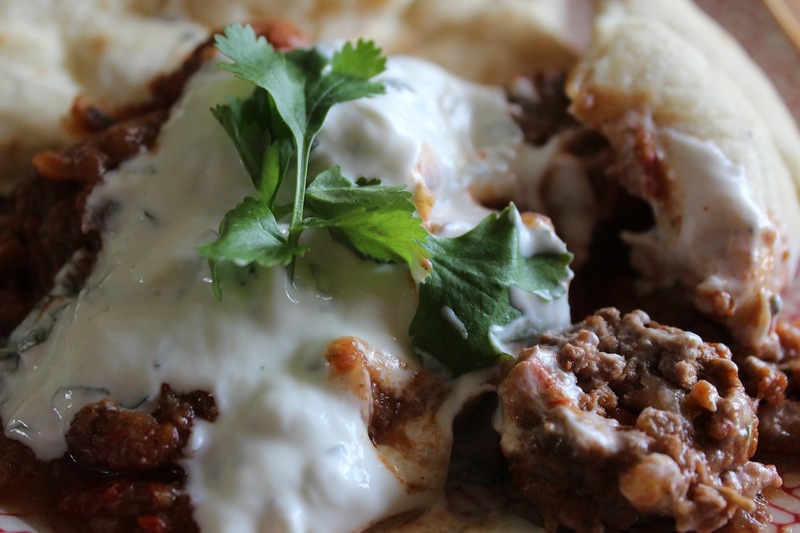 Mix together all creme fraiche ingredients in a little bowl. 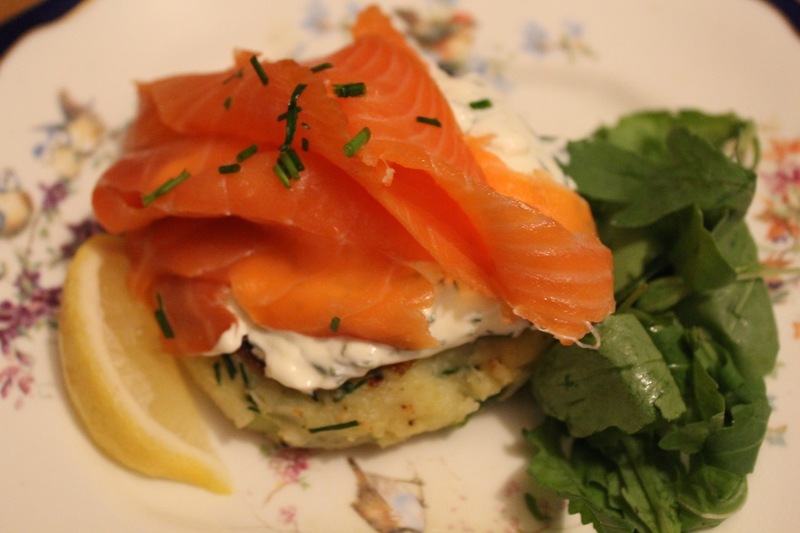 Dollop the creme fraiche on top of the potato cakes and drape the smoked salmon over the whole lot. 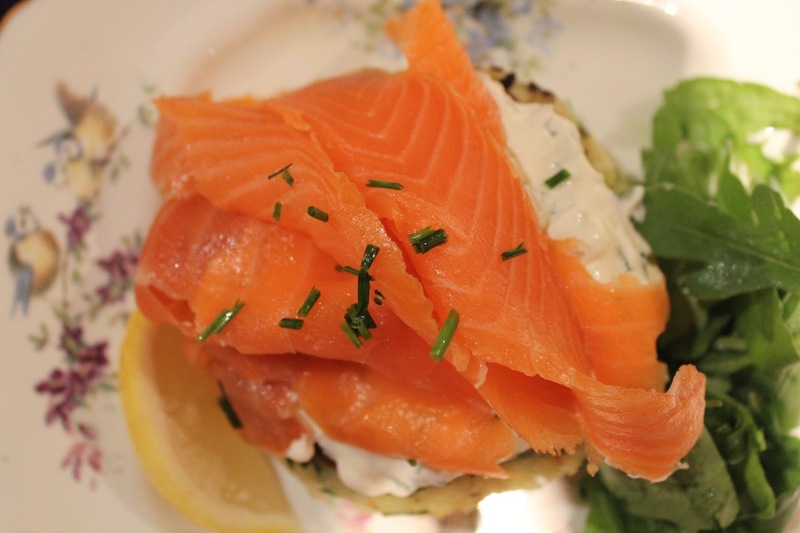 Serve with a lemon wedge on the side or squeeze a little lemon juice on top of the salmon.